Where is debt-ridden Pakistan heading? Last week, we saw Pakistan reaching out to every conceivable friend for bailout assistance. The government was also unable to control radical elements that overpowered its decisions and judiciary in Asia Bibi case. Pakistan's foreign reserves have plunged 42 per cent since the start of the year and now stand at about $8 billion. As per the State Bank of Pakistan report, the total debt of Pakistan in 2018 stands at 78.4 per cent of its GDP. What Imran Khan has got from Saudi Arabia is meagre $3 billion support for a year and a further loan worth up to $3 billion in deferred payments for oil imports. He must have gone to China mentally prepared to mortgage anything to get a similar bailout package. Meanwhile, China said more talks are needed to finalise economic aid to Pakistan. China knows that despite its help Pakistan will have to go to IMF for another bailout. China may not be comfortable with the kind of transparency being demanded by them including the details of debt to China. It may also not be keen to be pulled into the middle-east cauldron, the rivalry between Saudi Arabia and Iran or Shia-Sunni divide. China itself is struggling with the Trade War and poor returns on investment in BRI. Since the launch of the CPEC in 2015, power generation and infrastructure projects in Pakistan worth $28 billion have either been completed or proceeded to advanced stages of construction. China will seek the assurance of Imran Khan about the smooth development of the project, because he has slashed $12 billion reducing CPEC to be worth $50 billion projects from planned $62 billion, and ordered an audit of the same. Despite Imran’s anxiety and optics of wiping out corruption, Chinese will like to wait for any big ticket announcement till they are sure about the security of their project, 30,000 workers, security personals, and future of his association with Pakistani Army, ISI, and militant groups. It can also be argued that to avoid IMF scrutiny China may be little more liberal with debt aid package to keep Pakistan afloat minus IMF loan, if possible. There can also be some quid pro quo in keeping the US out of this strategic space, some land grab (With earlier precedence of ceding Saksham Valley to China) or mortgaging some other sovereign rights. The way the Supreme Court decision to acquit Christian woman Asia Bibi in a blasphemy case triggered mass protests by radicalised elements. Militant groups like Tehreek-i-Labbaik Pakistan (TLP) and others including Hafiz Saeed outfits, outrightly challenging the government machinery, Supreme Court and Law and Order machinery, despite a warning personally by Imran Khan, indicates mass radicalisation. Radical elements forced the government to an extent that it is likely to put her on Exit Control List (ECL). The militant groups like Jamaat-ud-Dawa (JuD) and Falah-E Insaniat (FIF) have been taken off from the list of banned outfits. The Financial Action Task Force (FATF) that visited Pakistan last month, has also expressed dissatisfaction over any worthwhile control over terror funding. The support of Pakistan Army and ISI in developing terror support infrastructure to pursue a proxy war against India and Afghanistan is unlikely to be weakened due to their flawed narrative of ‘India Threat Theory’ to legitimize holding strings of power in their hand. The fact that there has been an increase in defence expenditure and Pakistan aspires to be the fourth largest nuclear power in the world, clearly indicates that its military will not allow the government to muddle with its plans. The Asia Bibi case gives an impression that Pakistan is in the dangerous path of Islamic radicalisation, which can lead itself into a semi-caliphate if radicalisation in Pakistani Army increases, but there is a catch. An unstable Pakistan is not in global interest, nor in the interest of China as well as India, because it will take no time in getting converted into the largest jihadist caliphate. It is the biggest harbour of terrorists in the world and does not seem to be inclined to any change in the status quo. It has been kept financially afloat in past by the United States, because of the reasons mentioned above and its strategic location, which was crucial to them at that point of time. Now for similar reasons and getting warm water access to its western region, China may have every reason to keep it financially afloat. Pakistan’s other friends may also help directly or indirectly to pursue their own specific agendas. It may not be an exaggeration to say that it may lead Pakistan to be a future Chinese colony. For the time being China and other interested parties will not let Pakistan sink. 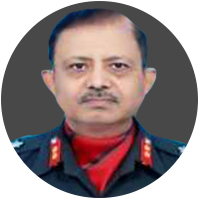 Major General S B Asthana had been an Infantry General with 40 years of defence experience at national and international level.